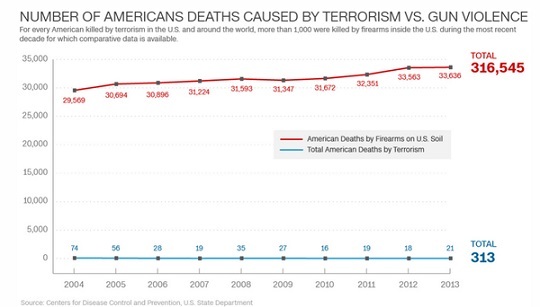 Jazz Shaw has a great post over on Hot Air that really picks apart those numbers that the main stream media used to take President Obama up on his challenge to compare the number of Americans killed by terrorism and those killed by people who used a gun. 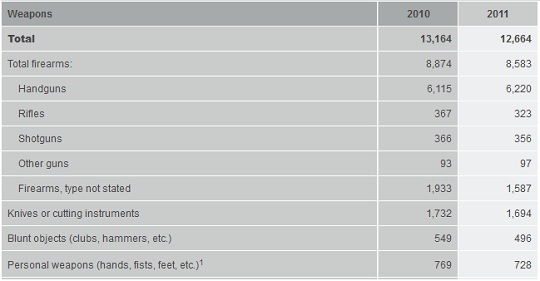 First of all, look at the number of gun deaths on that chart from 2011. It’s 32,351. That’s a lot of gun deaths to be sure. So that’s the total number of murders by gun owners, right? The answer is not only Hell No, but it’s not even remotely close. It’s true that this figure is close to the total number of human lives ended in incidents involving a gun, but that’s all incidents. So how did those deaths happen? Straight from the CDC where most of the media is drawing their numbers (while not as good of a source as the FBI or the Justice Department) we can find out that of those 32,352 gun deaths, 21,175 of them were suicides. That leaves us with 11,177 deaths to account for. But as it turns out, the FBI records that 8,583 deaths were murders of various sorts involving guns of all types. The remaining roughly 2,500 were accounted for by accidents and unintentional injuries. These include hunting accidents, toddlers getting hold of unsecured weapons and shooting somebody or just plain idiots who proved Darwin right. After almost every mass shooting, one of the top three proposals from the gun ban lobby is we have to ban so-called “assault weapons.” That’s just one more “check off the list” proposal because when we look at the actual 8,583 gun murders committed in 2011, only 323 were committed with rifles. That’s not just “assault” rifles, that’s all rifles, including bolt action, hunting rifles and all the rest. Shaw notes that the number committed with so called “assault” rifles were a fraction of the total. Compare that with the almost “1,700 who were stabbed as well as nearly 500 murdered with blunt objects and and more than 700 beaten to death by somebody with their bare hands.” I guess the advocates for victims killed with hammers and fists will soon be calling for a ban of those too. So we’re down to 8,583 intentional killings using guns. That’s still one heck of a lot of bodies, and surely enough to justify new background checks and other restrictions on legal gun purchases, right? Again… not even close. The Justice Department has been studying the question of legal vs. illegal sources of guns used in crimes for decades, going back to this study issued in the early nineties. They admit that the numbers are simply too hard to track for us to pin down exact figures, but the trends are steady over the years. The vast majority of guns used in crimes were gotten through illegal means outside the legal purchase regimen followed by law abiding gun owners. Roughly one quarter of inmates convicted of gun crimes admitted to having stolen a gun in that study. For the ones that weren’t stolen directly, another 2004 study showed that 40% of convicts bought their guns on the black market and another 37% got them through the “gray market” in various illegal methods. In fact, one study after another has shown that legally purchased weapons which followed all the normal firearms transfer rules accounted for somewhere between six and eight percent of all murders. And the majority of those were domestic violence incidents, violence between family members, crimes of passion and, yes… murders committed by the insane. But let’s give the gun grabbers the benefit of the doubt, round it up and say that ten percent were committed with legally purchases guns. That works out to around 850. We can agree that 850 is still too many people, but it’s nowhere near the 32,000 per year that the gun ban lobby typically talk about. The vast majority of people who die by firearms do so at their own hand, suicide. As Shaw and others have noted, that’s not a gun control issue. Accidental (or negligent as I prefer to call them) deaths are also a small part of the total but those numbers have been going down steadily over the years and the NRA and the National Shooting Sports Foundation have done a good job helping to make that happen. So, the next time someone pushing gun control tries to trot out that over 30,000 people a year die because of “gun violence” you now have the facts to effectively refute them. If anyone has the moxie to copy this, sign their own name to it, and forward it to their members of Congress and their Senators, feel free. If you attribute it to me, though, don’t change it. The federal government is not delegated the authority to legislate, enforce, or adjudicate laws pertaining to the exercise of our rights. Period. The federal government is not delegated the authority to require government permission to exercise a right. The federal government is not delegated the authority to compel us to waive our 4th Amendment–guaranteed right to be secure from unwarranted interrogation, search, or seizure in the absence of probable cause of criminal conduct as a precondition to being allowed (or denied) to exercise our right to keep and bear arms. The federal government is not delegated the authority to compel us to waive our 5th Amendment–guaranteed right to due process as a precondition to being allowed (or denied) to exercise our right to keep and bear arms. The federal government is not delegated the authority to compel us to waive our 10th Amendment right to a federal government exercising only those powers delegated to it by the United States Constitution, and State governments are prohibited the exercise of any power prohibited to the States by the United States Constitution. The federal government is not even delegated the authority to license firearm dealers or operate or fund the most powerful anti-rights government agency on the planet called the Bureau of Alcohol, Tobacco, Firearms, and Explosives. The purpose of compelled background checks as a precondition to allowing or denying the transfer of a firearm is to sucker firearm owners and prospective owners into unknowingly waiving their rights guaranteed by the 2nd, 4th, 5th, and 10th Amendments so they will have no rights left to claim when the current rogue occupation government decides to confiscate our firearms. The federal government has no authority delegated to sucker and scam its citizens into waiving their rights or acquiescing to the loss of their rights by subterfuge, scam, fraud, or force. We will not comply with your color of law, and any attempt to confiscate our firearms will be viewed as an armed insurrection against the authority of the United States, which is exclusively the Constitution of the United States, in violation of 18USC2383 and associated statutes, and will be forcibly resisted. A federal government which does not derive its lawful and limited authority from the Constitution of the United States is by definition a rogue occupation government. Its authority is null and void and no one is bound by any rule of law to obey it.